What’s a GLOCK…that isn’t a GLOCK? That is, something that looks like a GLOCK, runs all night and day without ever having a malfunction…just like a GLOCK. But is made without a single GLOCK part. Well, the folks behind that beautiful Frankenstein of a gun were the people at Lonewolf, and that gun was built on their excellent Timberwolf frame. How does the new Timberwolf frame work? How’s it different from the old one? Is it really worth upgrading from a standard GLOCK frame? 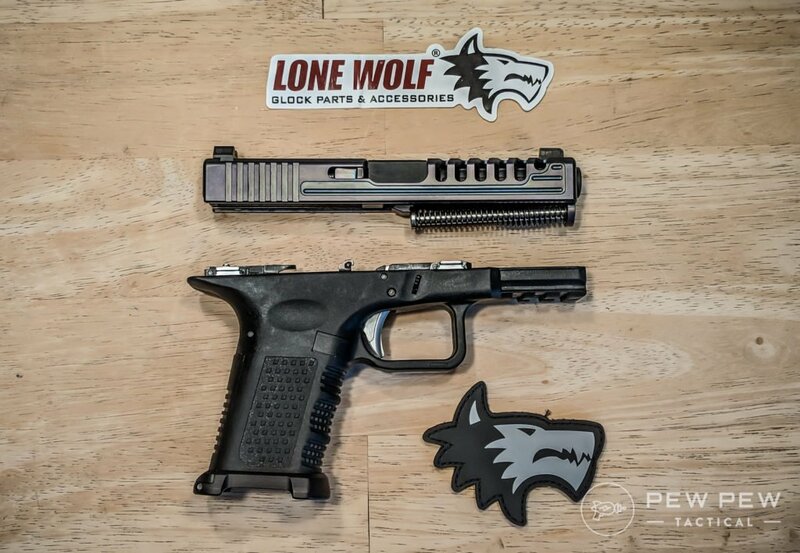 Lone Wolf makes an absolute ton of GLOCK parts, so much so that you can not only build a not-GLOCK with their parts, but you can build several different varieties based on what frame, slide, or grip that you want. 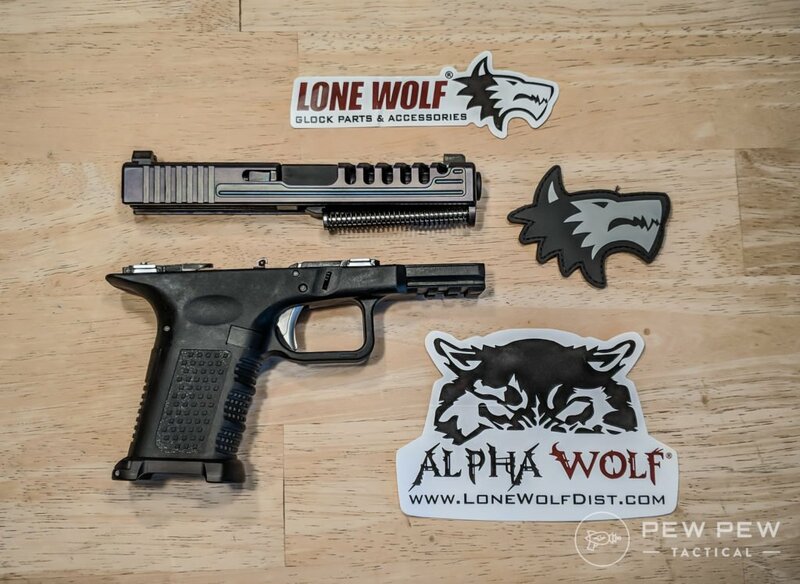 We’ve talked before about triggers, barrels, and other parts from Lonewolf before, and you’ll see their name anytime we or anyone else talks about the best aftermarket GLOCK parts, so there’s no doubt they make good stuff. I’ve always appreciated the quality of GLOCKs, but Gaston’s greatest never really felt right in my hand. I have very small hands, even for a woman (like actual baby hands), and there’s just something about a factory GLOCK grip angle that just doesn’t work for me. 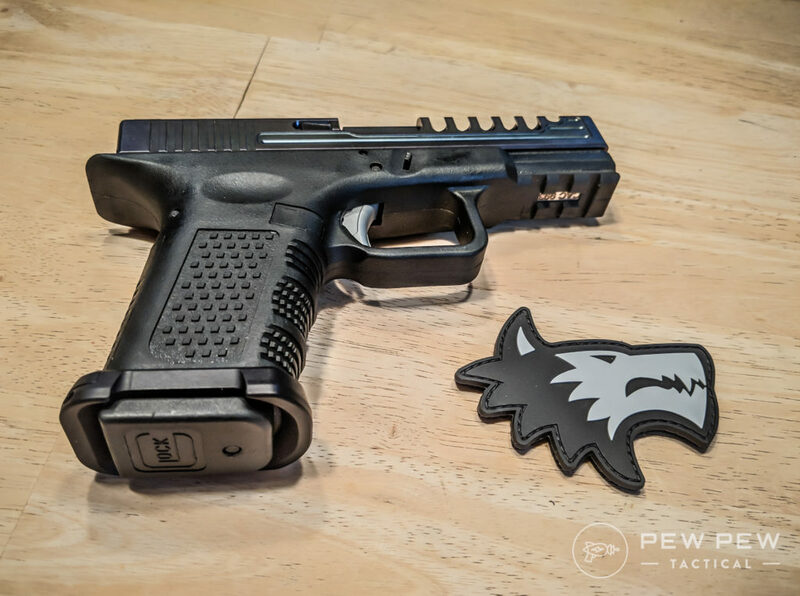 So when I got the opportunity to test out Lone Wolf’s brand new frame for the GLOCK platform, the improved version of their standout Timberwolf frame, I practically jumped at the chance. What Is the Lonewolf Timberwolf Frame? In GLOCK terms, the frame of the pistol is akin to what we’d call the lower in something like an AR-15. This is the part you grip, and it contains the magazine well and the controls, trigger, slide stop, mag release, etc. As far as the ATF is concerned, this is also the firearm and is the serialized part, which means each Timberwolf frame is a handgun, legally speaking. You’ll need an FFL transfer to receive it, and you’ll have to fill out the paperwork just like you would if you bought a complete pistol (shout out to Franklin Gun Shop for being my FFL of choice and for hooking me up with a free transfer). You’ll also need a slide, and some other parts to finish the frame, depending on whether or not you order the built frame or a blank one with no controls installed from the factory. For a slide, Lonewolf hooked me up with an absolutely gorgeous PVD-coated Alpha Wolf model slide with some excellent porting and lightening cuts (and a fabulous iridescent finish called Frost BIte) that has me swooning. Huge thanks to Luke at Lonewolf for helping me out with a slide! For your own slide, I’d recommend looking at Lonewolf first since you can be almost certain you won’t have compatibility issues (provided you order the right stuff) but other aftermarket slides of the correct generation model should work too. Of course, you can slap a factory GLOCK slide of the appropriate generation on top as well. 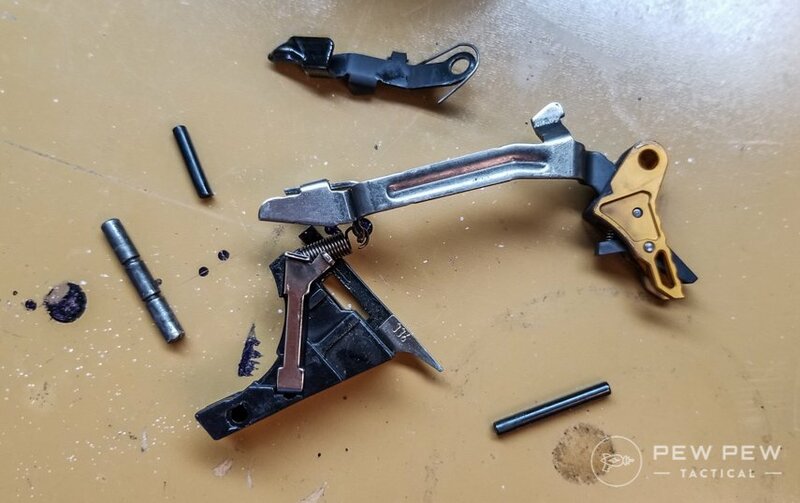 If you want to build your own frame and install your trigger, slide stop lever, and mag release of your choice, go with the blank frame and finish it yourself. If you’re like me and plenty happy with Lonewolf parts, or you just want the quickest option to get you up and shooting immediately, go with the built frame. Of course, all this was true of the original Lonewolf frame that came out a few years ago. Nothing has changed there. The game; the game is what has changed. Particularly for those of us with hands that don’t like GLOCK’s factory grip and grip angle. Women and men with small hands rejoice! The new Timberwolf frame is even more customizable than before, and it has a straighter, more 1911-esque grip angle that, to me at least, points better and shoots easier. The new Timberwolf frame is actually available in 16 different grip configurations, which means you can almost definitely find something that works for you. The overall ergonomics are also improved, and I think more natural to the hand than the previous Timberwolf frame. The grip is actually a hair or two larger, but even with my smallish hands, it doesn’t feel too large or unwieldy. In fact, I’m comfortable calling this the best option out there for women who want GLOCK performance, but don’t feel like they can get a great grip on a standard GLOCK. These new frame and grip options aren’t just for the small-handed among us, however. This unprecedented number of options is a huge boon for those who like to carry concealed as well. See, when you’re trying to avoid “printing” where the outline of your gun is visible through your clothing, it is not really the slide length that’s the problem, its the overall thickness of the weapon and the grip that are most problematic. This is, of course, a huge problem for everyone, but especially women who tend to wear close-fitting attire. The great thing about all these different grip options is that you can combine a long slide (for easier target acquisition, recoil control, and sight alignment) with a smaller frame than what you can get from the factory. This leaves you the opportunity for some true Frankenstein builds, like a Glock 19 slide on a much smaller Glock 26 frame. This type of build-your-own, mix-and-match customization gives you the best of both worlds. You have a gun that is both more shootable and more concealable at the same time. Finally, we get to my favorite part: the lower bore axis. The bore axis of your firearms is basically a fancy way of saying “where the barrel is”. 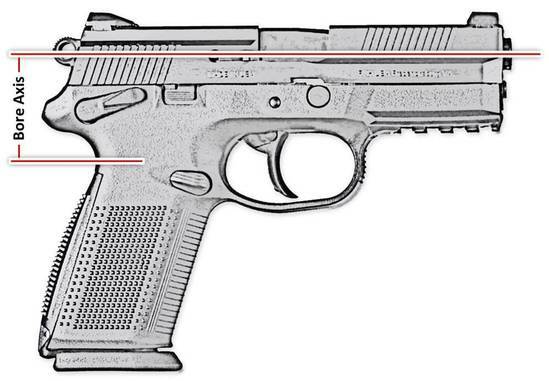 For controlling muzzle flip during shooting, a lower bore axis means you have less of a levering effect going on. With a lower bore axis, the upward motion of the muzzle is reduced, and you get more of a rearward push, rather than an upward flip. This is huge for accuracy on follow up shots and rapid fire strings. This makes the new Timberwolf frame great for competition shooters as well, as you get many of the features of a custom race gun out of the box. Honestly, I think that if you want the best out of a GLOCK at a competition environment, this is as good as it gets, at least for what’s currently available. That lower bore axis is also useful for everyone from those looking for a duty gun upgrade, to hunters as well. Which brings me to my next point: who’s this thing really for? That’s easy to answer: everyone! Commissioner Gord- I mean, Gary Oldman agrees – EVERYONE! Seriously, if you’re a hunter looking for a 10mm backup gun for those dangerous hunts in bear country, there’s a G20 version, or a G21 version if you like .45 ACP. If you’re a competition shooter and you want every edge you can get for your next simulated shootout, the low bore axis and a huge amount of customization (not to mention the excellent trigger out of the box) makes this a great choice that will go toe-to-toe with anything out there. Finally, if you want to make sure you have every possible advantage in an actual shootout, the new Timberwolf frame gives you everything you need to get out alive. In a life-or-death situation, the best tool is the one you have, but I’m a firm believer in bringing the very best tool I can get my hands on. And if you think that a GLOCK is the best tool, I think you’ll find it gets even better with the Timberwolf frame. But then again, bore axis this, and ergonomics that doesn’t matter if the darn thing doesn’t work. To find out if the Timberwolf frame was really all I thought it’d be, I took it to the range with my fiance and some friends, and we put it through its paces. With the lower bore axis I, as well as the three other people I had shoot the new Timberwolf frame all had an easier time with rapid-fire shots on target than we did with a comparably-sized factory G19. Some of that might be down to the better trigger in my Timberwolf frame, but without fail, everyone that shot the Timberwolf version mentioned less felt recoil than with the factory GLOCK. Rapid-fire and double tap groupings all shrunk as well, and more so than could be accounted for by a simple trigger upgrade. This is the big selling point for me with the Timberwolf frame. You have an already great firearm that’s made that much better by a few simple tweaks and adjustments. Credit where it’s due, Lonewolf didn’t reinvent the wheel here, they just took the wheel GLOCK designed, and made it a little bit better. Personally, I shot better with the Timberwolf frame than I ever have with a GLOCK-brand GLOCK. I was hitting targets at a faster pace, and follow up shots were quicker and easier. The slide Lonewolf sent me had some excellent night sights on it, and after I found my rhythm, they barely seemed to move at all. Overall, I can definitely say that the lower bore axis is much more than marketing hype, and it really does make a huge difference having the barrel sitting closer to the top of your hand. The beavertail grip also lets you grip the pistol very high, without worrying about slide bite, which adds to the effect of the lower bore axis. I think that, with the improvements to the frame and to the grip area, this might be my new favorite handgun to shoot. I will forever be more of a rifle gal at heart, but if anything could sway me to the Darkside, it’d be this gun. Shooting blazing fast is great and all, and putting rounds right where you want them is even better, but even if you’re looking for a safe queen or something that only comes out for range work, reliability is always key. How reliable is the Timberwolf frame with an Alphawolf slide? How reliable is a Swiss watch? How reliable is a German car? I’ll tell you, neither is as reliable as an Austrian pistol that says “GLOCK” on the side. You know what is just as reliable as a GLOCK-brand GLOCK? A Lonewolf-brand GLOCK. We shot about 400 rounds through the gun on its first trip out, and I’ve added another few hundred since then, some Hornady hollowpoints, cheap FMJ, expensive (relatively) FMJ, lead flatnose rounds, the gun ran all of it without one hangup of any kind, and no maintenance other than lubing everything up before its range debut. I’ll freely admit that I didn’t really expect the Lonewolf frame to bump my accuracy up all that much over a regular GLOCK. I was wrong. Mechanically, from a rest, the gun is as accurate as its OEM counterpart, maybe ever so slightly more so, but I’d need a lot more shots on paper with high-quality ammo to really confirm that. Where the gun really excels, is shooting freehanded. Shooting one-handed, two-handed, from a draw, rapid fire, slow fire, double taps…every single thing you can think of, the Lonewolf frame wiped the floor with my fiance’s almost identical G19. He even shot better with the Timberwolf than his nearly bone-stock Gen 4 G19, and he loves that gun only slightly less than he loves me and our cats. It really impressed me that someone with easily 3,000 rounds on one particular gun, his carry gun, still shot better with the Timberwolf (not that he’ll admit it). Some of that might be the excellent slide Lonewolf included, but the increased shootability, which is the frame’s real selling point, is the key factor here. It’s still basically a GLOCK. As Tommy Lee Jones says, you can pour sand in it and it’ll still shoot. Even with a Lonewolf slide, the gun isn’t really noticeably more mechanically accurate than a standard GLOCK, but a factory GLOCK is still capable of better accuracy than most shooters can give. This frame just makes it easier to get the very most out of the available accuracy in the GLOCK platform. I know GLOCK say they have the market cornered on “Perfection” but I really think there are some improvements here over the factory GLOCK grip, even the new Gen 5s. The simple fact is that not everyone is going to need a performance frame like this, and you might very well see more benefit from just putting in more range time. Of course, if you’re a serious shooter, it’s hard to put a price on getting what might very well be the best shooting upgrade in its class. Overall, I’m in love with this frame and if I don’t choose to pay my own money to keep it, it’ll just be because I want one in a different size or caliber (or maybe a different color). I can’t really give higher praise than that. As it stands right now – the Timberwolf Frame isn’t for sale right now, but it should be coming soon! However, the Timberwolf Large Frame is currently offered by Lone Wolf. This is the same frame but for larger Glocks such as the Glock 20, 21, 29, and 30. What do you think of the new and improved Timberwolf frame? Interested in picking one up for yourself? 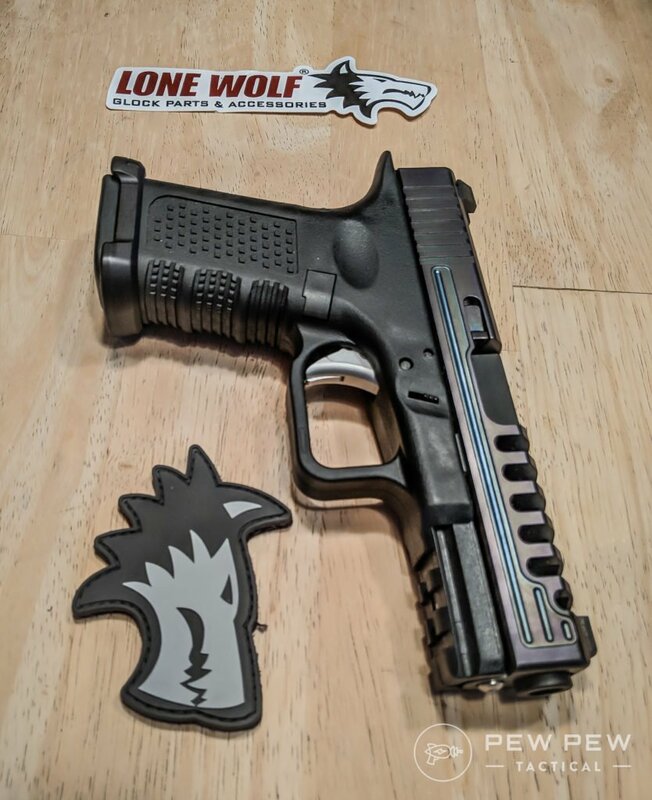 Drop me a line in the comments below if you have any questions, or if you just want to talk about this awesome new GLOCK upgrade from Lonewolf. Ready to upgrade your current or new Glock? The Best Glock Upgrades will get you started off right!